It seems that sous-vide cooking is becoming increasingly popular lately. [Meseta] caught the sous-vide bug and wanted to try his hand at it, though he did not have enough money for a premade sous-vide cooker. After seeing a good handful of lackluster DIY sous-vide rigs online, he decided that he would design and build a sous-vide cooker of his own. He already had a Forebrain microcontroller at his disposal to use as a PID controller, but what he really needed was a cooking vessel. Rather than use an old crock pot or similar device, he purchased a small personal refrigerator that could be used for cooling or heating. The unit ran off a Peltier cooler that could be switched between modes, making it quite easy for him to control. In his blog, he discusses the modification from beginning to end, and even shows off the results of his cooking endeavors. He hasn’t posted code as of yet, but he says that he is more than happy to share it with anyone who might be interested in building their own sous-vide cooker. Be advised of the kinds of plastics used in this method of cooking. Some plastics may leach off chemicals that mimick hormones. Estrogen is usually the case. Now I know that people are going to smirk and laugh and say “hey, I don’t have moobies!!1! yous wrong lulz idiot” but no, it won’t girly you up, it will make your endocrin system fight back hard and if your not of exceptional health, the overcompensation of testosterone will go into wild fluctuation. The result is that your head goes bald, and your back and arms get hairy like an ape. You can see this in the proliferation of such plastics: men in their 30s with pattern baldness of men in their 50s, and enough hairballs at the beach to make you feel like you need silver bullets. This is not a trolling attempt, but I just want to make sure people know the risks of using plastics in this manner and to be careful about the kind of plastics used. This has more to do with the type of plastic bag you seal the food in, right? I assume one would need to ensure the bag is rated for sous-vide in order for it to be safe. So the guy says he’s using Tesco “microwaveable” bags because he says they’re probably safe for sous-vide. Is that the case? Also be advised that plenty of restaurants will use this method of cooking and have no obligation to let you know. I’ve been using the “slow cooker-aquarium thermostat” type rig for over a year now, and the results are great. Only problem is volume. Comes the time when you want a much bigger volume of water to be able to load multiple meals and so on. 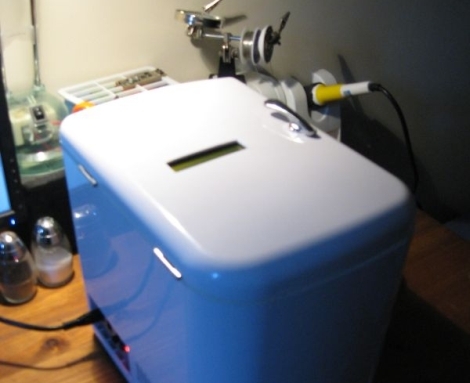 When I bite the bullet, my next version will be an electric tea urn and arduino driven PID controller – that’ll give me 20+ litres of controlled water bath for less than £60 sterling ($90 US) – or do I go for two 10 litre urns so I can run two temperatures? Hmm. Both this and my current rig are essentially plug-and-play – so not really hacks at all. So one of the important things: ability to maintain temperature. Peltier devices are pretty famous for their inability to move much energy, though they are very good at using it. Still, one wonders if the recovery time on this is sufficient to be safe? Hah, I just bought a peltier module for some sous vide hacking myself! umm, and..? I’m sorry, but a one word comment really doesn’t contribute much to the conversation. Were you trying to warn the masses about the dangers of salmonella when using the sous-vide method? More information would have been nice, maybe even a link or two. I dunno, I haven’t had my mind-reading-drug-laced coffee yet this morning.